Jenny Mallin’s earliest memories are of her mother in the kitchen, tapping a wooden spoon against the side of the metal dekshi and then tasting her curry sauce, checking the ­seasoning. From that moment, Jenny was hooked and her mother continued to nurture her love of cooking throughout her childhood. The kitchen, a wonderfully warm and ­intoxi­cating environment, ­became an indoor playground filled with new ­experiences, challenges, and the end result – ­something ­delicious on a plate. She took such pride in helping her mother that it wasn’t seen as a chore, but as a special time together. Consequently, that love of cooking coupled with a desire to please someone with her food has never left her. With her passion for cooking, India, research and ­writing, the outcome has been a labour of love – a memoir that mingles the history of her family when they lived in India, with her grandmothers’ recipes that were prudently passed down through the generations. 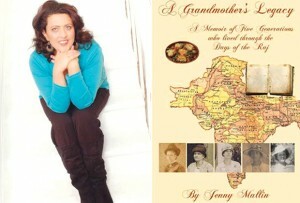 Each recipe has been lovingly ­researched, leading Jenny on a road of ­discovery about her ancestors, with her grandmothers’ legacy continuing to assist in providing clues to their rich and eventful past. All that is blended skillfully together in this story of a search that has led to a book. “Rai, jeera, huldi…” my mother would whisper under her breath whilst counting out the ingredients on her fingers. Cooking came naturally to her, but occasionally she would open the pantry door and out would come this huge ledger book, whereupon she would leaf through the pages until she found the recipe she was looking for. Hidden high in the pantry, this unglamorous-looking book, with its ochre, faded pages bespattered with sundry sauces and flavourings, revealed handwritten copperplate recipes dating back to 1850. Turning the pages of the book, you can see the handwriting style change over time, showing evidence of over five generations as each of my grandmothers have passed this on to the next generation. As a result, these pages offer us a glimpse into a fascinating time in history known as “the days of the Raj”, when India was under British rule. We know the very first pages of the book have been written by my great-great-great grandmother Wilhelmina Hardy, who was born in 1828. For a memsa­hib, it was an overwhelming and exciting adventure for those settling in India. It’s quite possible that Wilhelmina felt it good sense to write all her recipes in one book which could then be given to the cook to follow. The book provides us with so many clues as to my family’s lifestyle that it can almost be considered a time capsule. Generations of writing have not only chroni­cled events, but inadvertently thrown hints to us. When catering for large numbers, proportions of ingredients are upscaled and reveal to us a picture of entertaining on a huge scale; perhaps an open house party for neighbours, an elegant tea party, a special birthday event or, of course, the largest event, Christmas. Unknowingly, each one of my grandmothers has given me so much more than recipes. They allowed me an insight into their lives, where they lived, how they entertained, what kind of food they regularly ate, but, more importantly, why there were changes in their recipes and how they came about. It’s as if the pages of their recipe book reveals chapters in their lives. Life for them in India all started with an ancestor of theirs, Benjamin Hardy, a Yorkshire-born British Army soldier who went out to fight in India in 1799, fell in love with India and ended up settling there for the rest of his life. Benjamin and his wife Frances bore a son, named Joseph Hardy, in 1816. At the age of 30, Joseph married Wilhelmina Sausman. It was thanks to Wilhelmina’s foresight that her recipes are the very first pages of the book. Each of my grandmothers experienced life-changing events during their lifetimes, start­ing with Wilhelmina, whose schoolmaster husband was there at the threshold of the opening of the first English School in Mysore. In 1854, the East India Company promulgated the Halifax Dispatch, which suggested organising education in Mysore based on the Western model. This esta­blishment grew in status and became known as the Maha­raja’s College – now regarded as one of the oldest in India. During Grandmother Ophe­lia’s childhood, the rule of the East Indian Company was trans­ferred to the first Empress of India, Queen Victoria, ­following the Indian Rebellion in 1857. Maud and her family enjoyed a privileged status (because of her husband’s job as a Permanent Way Inspector on the railways) which allowed them to explore and travel around India in their own railway carriage, on the newly created railway which covered a vast network of 9,000 miles. Irene came from a comfortable middle-class background. She began married life as the wife of a prison warden on the Andaman Islands at Port Blair, living in close quarters to the infamous cellular jail which held notorious criminals. For my mother Cynthia, she would be experiencing perhaps the most major upheaval since my great-great-great-great grandmother Frances Hardy’s days – leaving behind in the 1950s the country she was born in to start a new life half way across the globe, emigrating to Great Britain after India gained their independence, a motherland with all its familiarity and yet in another sense totally alien to her.